The transportation burden on the railroads and highways of the country has been tremendously increased by the war. There is a larger load to be carried, of manufactured goods, raw materials, and foodstuffs. Not only has production of manufactures, raw materials, and farm products increased, but it is now necessary to transport a much larger proportion of these goods over long distances. The burden is further increased by the fact that we have removed across the sea, 3,000 miles away, a considerable part of our population, which must be provisioned and maintained. These men were in our Army camps last winter. This year there are other men in these camps, and we must handle goods and foodstuffs not only to these 30 new cities but to a great population 3,000 miles away. It is absolutely necessary to utilize our facilities to the maximum and to extend the use of the highways by the more efficient use of motor vehicles which can operate independent of fixed lines or terminals where congestion of traffic is likely to occur. The motor truck can help the railroad by reducing the short-haul load, and also act as a feeder line in sections far removed from market. Added to the increased loads of goods to be transported is the fact that man power must be conserved. Heretofore the farmer has done his own hauling to market, but adoption of the rural motor express will enable him to delegate his hauling and to devote his own time to farm operations. An enormous waste of time and labor of both men and teams can be prevented by consolidating the small loads from a number of farms into a single load to be carried by a motor truck. 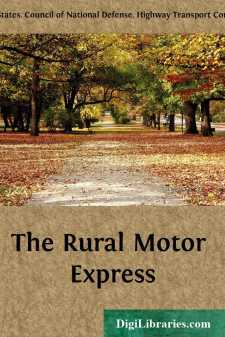 The Purpose of Rural Motor Express. The motor truck has demonstrated its adaptability to the hauling of farm products. It is dependable wherever the roads are capable of carrying its load. The use of the motor truck for farm transport is growing rapidly and in the vicinity of many cities regular routes are now maintained. The purpose of the organization of rural express on a national scale is to bring to agricultural communities throughout the country an understanding of the greater benefits to be derived from regular daily service over the main highways from farm to city and from city to farm. By "Rural Motor Express" is meant the use of the motor truck in regular daily service, over a fixed route, with a definite schedule of stops and charges, gathering farm produce, milk, live stock, eggs, etc., and delivering them to the city dealer and on the return trip carrying merchandise, machinery, supplies, etc., for farmers and others along the route. This service amounts to a collection and delivery that comes to the farmer's door with the same regularity that the trolley car passes over its tracks. The Council of National Defense approves the widest possible use of the motor truck as a transportation agency, and requests the State Council of Defense and other State authorities to take all necessary steps to facilitate such means of transportation, removing any regulations that tend to restrict and discourage such use. The highways transport committee of the Council of National Defense is charged to carry out the purpose of this resolution. The several State councils of defense have been asked to appoint highways transport committees, or to delegate the organization of rural express to some committee which will have charge of the development of the work within the State. These State committees will in turn further the work through local organizations. The Council of National Defense approved the widest possible use of the motor truck in its resolution of March 14, 1918. The Post Office Department has demonstrated the value of motor-truck transportation through experimental lines of parcel-post trucks now in operation in several of the Eastern States.